This week I want to talk about the origin of and continuing confusion over sociopathy as a psychiatric diagnosis. Unless otherwise indicated, the material/information is taken (edited for length) from "The Confusion Over Psychopathy (I): Historical Considerations," a paper by Bruce A. Arrigo and Stacey Shipley, printed in International Journal of Offender Therapy and Comparative Criminology, 45(3), 2001 325-344. 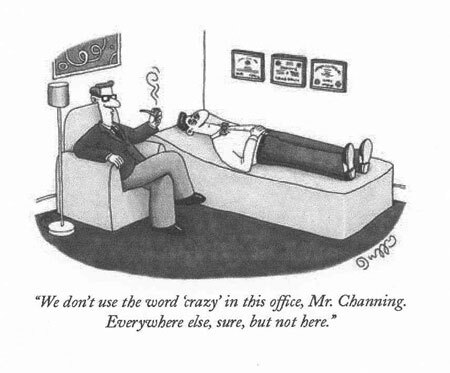 Notwithstanding its extensive heritage, psychopathy has been plagued by changing and uncertain diagnostic nomenclature. For example, a great deal of confusion currently exists regarding the relationship between Antisocial Personality Disorder (ASPD), as identified by the Diagnostic and Statistical Manual of Mental Disorders (4th ed.) (DSM–IV), and the modern construct of psychopathy as explained by Cleckley (1941) and further refined and empirically validated by Hare (1985, 1991). Although contemporary research supporting the diagnosis of psychopathy is at its strongest, mental health professionals remain perplexed when diagnosing, treating, or making recommendations to the court system about these individuals. In general, we note that the psychopathic label (i.e., explanation) has changed from the morally neutral view of Pinel (1801/1962) to the more truculent and disparaging characterization described by Kraepelin (1915). In addition, the designation itself has evolved from the unpopular term insanity, to the controversial expression moral, to the present moniker psychopathic. The elusiveness of the psychopathic construct and its meaning is further confounded by the theoretical basis out of which social scientists approach and investigate this mental disorder. Indeed, some researchers invoke descriptors for psychopathy, implying that the individual experiences morality problems that are solely personality based, exclusively congenitally or biologically derived (Ellard, 1988; Schneider, 1958; Smith, 1978), or principally behaviorally grounded (American Psychiatric Association, 1994). Moreover, notwithstanding these interpretations, Hare’s (1996) empirical and qualitative findings consistently demonstrate that the psychopath has distinctive affective, interpersonal, and behavioral attributes. Psychopathic individuals historically and at present are almost uniformly considered difficult, if not impossible, to treat. We submit that the diagnostic confusion surrounding psychopathy (i.e., the label and its meaning) and the adverse consequences persons in the mental health and criminal justice systems (potentially) experience in the wake of such a determination, warrant closer scrutiny. Although clearly not exhaustive, this overview will provide an important backdrop, making it possible to assess provisionally how psychopathy evolved into a mental disorder and a pejorative label. In particular, we will consider the logic of linking psychopathy, as applied to forensic clients, with the behavioral diagnosis of ASPD. This notwithstanding, the progression of thought contained within each of the components or categories demonstrates the course of psychopathy’s development and demonstrates how each has ostensibly functioned along a continuum (e.g., social condemnation as morally neutral to morally reprehensible, the disorder’s description based on personality to behavioral traits, and the locus of treatment from asylums to prisons). I studied nursing in college and it was discussed that ASPD is in borderline. Therefore, this can be considered as Psychological problem since you are isolating yourself from other people.